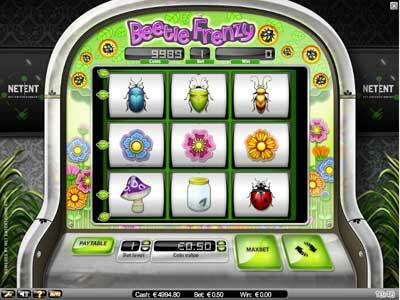 Beetle Frenzie is a 9 reel, five paylines slot game that actually looks like a 3 reel game. However, all the reels spin independently of each other. The theme is a wild garden bustling with beetles and so, symbols are blue, pink and red flowers, several bugs, including a stink bug, Beetle and Mushroom with a lightning bug as the wild and a gold apple as the scatter symbol. There is a nice opportunity to win a super win when 9 gold apple scatter symbols appear. 9 Blue Flowers make a payout of 500 times the your bet. The game sports three exciting bonus features, including second screen games. The maximum wins in this game are not too high but they are fairly frequent and this is what we like the most with a good slot.